And he took up a long sword that lay there and broke it before the eyes of Húrin, and a splinter wounded his face; but Húrin did not blench. Then Morgoth stretching out his long arm towards Dor-lómin cursed Húrin and Morwen and their offspring, saying: “Behold! The shadow of my thought will lie upon them whenever they go, and my hate shall pursue them all to the ends of the world. 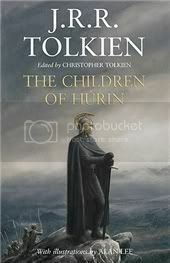 Set in the first age of Middle-Earth, long before the evens retold in The Hobbit or The Lord of the Rings, The Children of Húrin is the tragic story of Túrin and Niënor, and of how the curse that the Dark Lord puts on their father ruins their lives. Like any tragedy, it’s relentlessly bleak. These characters are trapped; no matter what they do they cannot regain control of their lives and avoid loss after terrible loss. The story mostly follows Túrin, but his mother and sister are also not spared. It’s a depressing story, but in many ways it’s also very satisfying. 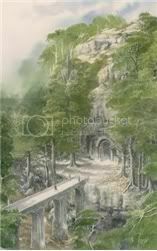 One of the reasons why I love Tolkien is the sense of world-building depth I find in his books: Middle-Earth seems to exist far beyond the pages of his books, to have a long history of which we’re only allowed a few glimpses, to have corners that will forever go unexplored. It feels alive, and I absolutely love that. So to be allowed to return to it for a little longer was a treat. Even though I love Tolkien and Middle-Earth, I have not yet read The Silmarillion. And the reason why I haven’t is because I have always been told that it describes events from a distance, like a saga or a history book, without ever quite zooming in on any of the characters. That’s not necessarily a faulty approach, but I'm a character-oriented reader, and being able to feel close to Bilbo and Frodo, to Merry and Pippin, to Aragorn and Gandalf, only made The Lord of the Rings and The Hobbit more enjoyable for me. In The Children of Húrin, I was never able to feel close to any of the characters. This is something that also happens when I read a Greek tragedy, and I know it's meant to. I don’t think it means that Tolkien’s characterization failed; it’s just the kind of story that this is. But being the kind of reader that I am, I wasn’t quite as involved or moved as I would have been if I had felt close to the characters. Nevertheless, there is a lot to love here. It’s a dark and beautifully told story, and I don’t think most Tolkien fans would find it in any way disappointing, not as long as they bear in mind that this is not quite the same kind of storytelling that we find in The Lord of the Rings. Also, the book is beautifully illustrated by Alan Lee—there are full colour illustrations AND back and white ones at the beginning of each chapter—and that alone makes it a treasure. Annie keeps talking about reading this, but she just hasn't made the time yet. I'm surprised you haven't read The Silmarillion, as I would have guessed it would be something you'd love. (Not that I've read it, of course.) Annie LOVED it...I think nearly as much as LOTR. Can you believe I've never even read The Hobbit?!! Yeah, there's definitely something wrong with me, huh? Alas, I am one of those readers who has never been able to make it through The Lord of the Rings - neither the books nor the movies. And ironies of ironies, I have stalled in the same place for both, the end of the Two Towers. I know people are very passionate about the books, but to me they just have people walking about (even the Ents, which are pretty much trees in my book, walk around!) for a thousand pages. By the end of the Two Towers I always give up and can no longer bring myself to care about anyone or anything any more... I just want it to be over, hence I stop reading! But I did read and enjoy The Hobbit (twice, for school - once in fourth grade, once in tenth grade). Faster paced and 100% less Tom Bombadil! It's win, win, win! I still can't bring myself to read Tolkein. He scares me. In The Children of Húrin, I was never able to feel close to any of the characters. I think this is part of the reason why I've avoided this one. I worry that the Christopher Tolkien-edited tomes are simply fleshing out the backstory. But I know that's an unfair judgment since I haven't read any of them yet. In a way, I envy your ability to read these other Tolkien works. I love the Hobbit and Lord of the Rings, but every time I've tried the "backstory" books I get lost and tired and it feels so tedious. I thinks it's because the characters feel so distant. It has the effect of keeping me out of the story, and I just can't make it through. I loved The Lord of the Rings but I struggled with The Silmarillion. The Children of Hurin has been on my wishlist for a while. The illustrations are just gorgeous. I've always wondered about this book. I have seen it several times when browsing the shelves, but never has it made its way into my shopping bag. I too love when you get to be close to the characters....it makes the book even more personal...so that might be a slight drawback for me. I am wondering if I am the only person on the planet, not to have read The Lord of the Rings trilogy and The Hobbit. What do you think? I am against reading Tolkein and I have absolutely no idea why. I haven't even seen the films. I first read The Hobbit and The Lord of the Rings when I was eleven years old, and have loved them all my life. My husband reads all the backstory books and tells me the stories when I ask about a certain character. It's one of the nicer divisions of labor in our marriage! "It’s a depressing story, but in many ways it’s also very satisfying." You captured it right there. It is indeed both of those things. I really enjoyed the experience when it came out. I have to admit that I am one who loved The Silmarillion. I've read it once all the way through and various portions of it over and over again. It adds so much to Tolkien's overall world by providing details of the layers of history and time that occurred before the events of The Hobbit and The Lord of the Rings trilogy. You are right in that there are not a lot of opportunity to get close to characters. For me it was, and continues to be, an immensely satisfying experience to read and revisit. To me, the Silmarillion read like the Bible. I will have to find out if my mom has this book. I like to buy her very nice editions of Tolkien books when I can find them, so this sounds perfect. I'm a Tolkien fan and for awhile I was trying to read as much of him as I could. The Hobbit and LotR of course, I've read, but I've also read The Sil. I enjoyed it, but it definitely is more like a textbook than a true story. You've just reminded me that I need to read this book. It's in my TBR! So, you know I'm a fairly new lover of all things fantasy. I was never one of those kids that read it. Charles de Lint started me on this journey about 4 years ago, and I've loved it and craved it every since. With that said, I'm going to admit to you my dark secret: I have never read Tolkien: No Hobbit or LOTR. Nothing. I should probably remedy that sometime if I want to call myself a fantasy reader!! The thing about the Silmarillion is it was put together by Tolkien's son. So some bits are just cobbled together back story, but some bits are truly written by Tolkien as stories in themselves, and not just research notes. 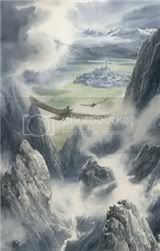 I would read it just for the story of Beren and Luthien, which shines like a jewel in the middle of all the dry history. Its not at all removed, and all about character. I think you will love that part. I just started on a borrowed copy of this book when it went missing from my room; someone borrowed it from me and I never got to finish it. I'm thinking of buying all of Tolkien's works; I've postponed it for far too long. I, on the other hand, HAVE read Silmarillion -- and I've never read The Lord of the Rings. My husband and I did a team read -- it took about six months -- and I actually enjoyed it a lot! I considered it a treat to be swallowed up in the Biblical/fairy tale like language and yes, I was distanced from the characters but like you say, it was meant that way. I am considering joining in the LotR read along in the new year but I really disliked The Hobbit so I'm thinking the traditional adventure stories aren't for me. Haven't read Children of Hurin yet but will do at some point. You really should give The Silmarillion a try, I really enjoyed it. You can always approach it as a book about mythology, if that makes sense? I'm a fan of Tolkien, and have had this book in my TBR forever. I agree, Tolkien had a way of making Middle Earth and its inhabitants seem like a real place. I love that. I did read The Silmarillion, and if I remember correctly, it does mostly describe everything from a distance. But I still enjoyed it. I would recommend the Silmarilion. Its dry and has much less narrative (in the sense of plot) than Tolkien's other works but if you enjoyed the Children of Hurin I think you'll still find much to love. I read it the first time as a teenager and found it very dull indeed. When I came back to it a few years later, however it had magically transformed into readable prose. Its very worth the time, especially in terms of expanding the limits of the world. Steph: lol - you're not alone re: Tom Bombadil. I don't hate him, but I wouldn't call him a favourite either :P But anyway, I can definitely see why LoTR isn't for everyone. Loren Eaton: I haven't read much myself either, but it seems that they are, yes. Which doesn't mean they're bad, necessarily. It's just good to know what to expect. Jeane: Yes, the distance is definitely there. I guess that, like brideofthebookgod was saying, we should look at it as mythology? Bella? Aren't they? I love Alan Lee! GMR: It's a bit of a drawback for me too, because that's just the kind of reader I am - but I'm still glad I read it. 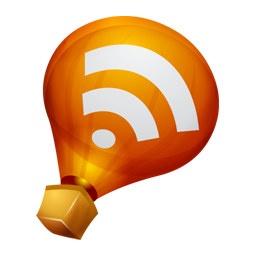 heidenkind: lol, an interesting analogy :P And this edition is definitely nice! I was lucky enough to find the hardcover in a bargain basket, yay. Trisha: I think that I just need to keep that in mind before I start it! Stephanie: It's not a dark secret! It's never too late, really. And as much as I love Tolkien, I don't think he's the end-all and be-all of fantasy. He brought the genre a lot of attention, but modern Tolkienesque fantasy is actually not my favourite at all. Masha: It sounds like I definitely will! Rebecca: It does - the whole book is pretty much about them. Also, The hobbit is really very different from LoTR, so don't let that discourage you! brideofthebookgod: That does make a lot of sense! And I love me some mythology, after all. Naida: You've all convinced me that I'd enjoy it too! I was just talking to my husband about this book. I clearly remember buying it for him, but he says he hasn't read it. He says it looks really dark and dreary, and after reading your review I guess I can't contradict him on that! I do think the illustrations are beautiful though! I've heard a lot about these but I haven't picked them up. I read The Hobbit and The Lord of the Rings trilogy shortly before the first movie came out. Those are seriously beautiful illustrations. I love this: "Middle-Earth seems to exist far beyond the pages of his books, to have a long history of which we’re only allowed a few glimpses, to have corners that will forever go unexplored. It feels alive, and I absolutely love that." And couldn't agree more. I have the book, haven't read it yet. I enjoyed the time I spent in Middle Earth when I read Tolkiens Hobbit and Lord of the Rings. I've been wondering about this one. I agree with you; Tolkien is a master world builder. I think that's part of the reason I love his books so much. Thank you for your thoughts on this one, Nymeth. I do hope to read it one of these days along with Silmarillion.